Preheat oven to 375°F and prepare 11x13 baking dish with cooking spray. Season inside of squash with salt and pepper. Lay halves cut side down in baking dish and bake for 30 minutes. While squash is cooking combine anchovies, Classico® Riserva Triple Olive Puttanesca Sauce and crushed red pepper in a sauce pan and bring to a boil, then reduce heat to a low simmer. While sauce is warming, toast pine nutes in a dry small skilet over medium-low heat, tossing often until golden brown, about 4 minutes. Set aside on a plate of bowl. When squash has finished cooking, remove baking dish from oven and scrape squash crosswise to pull strands from shells into a medium bowl. 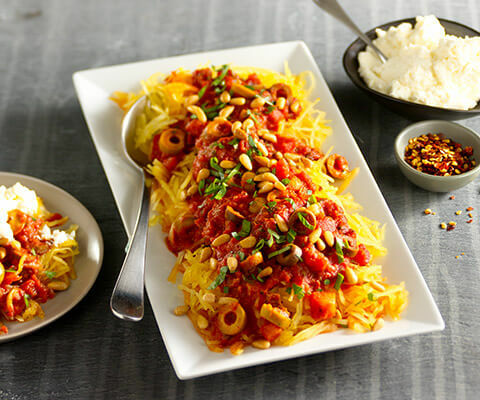 Cover squash with heated sauce and toss with half of the basil, half of the parsley and the pine nuts. Portion onto plates and serve with a dollop of ricotta and garnish with remaing basil and parsley. the picture looked great, but mine came up very runny. maybe there was a step i missed to drain the squash once it's roasted.